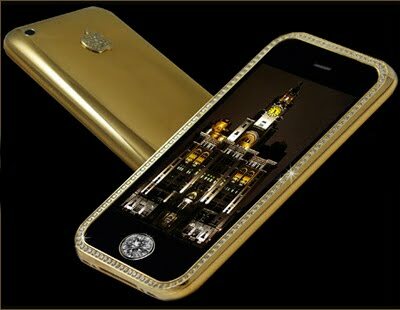 Priced at £1.92 million, the casing was created with 271 grams of 22 carat gold. The front bezel houses 136 flawless diamonds, which total 68 carats. The rear logo in solid gold has 53 flawless diamonds and the front navigation button is home to a single cut 7.1 carat diamond. The chest which houses this unique handset is made from a single block of granite, lined with Nubuck top grain leather. 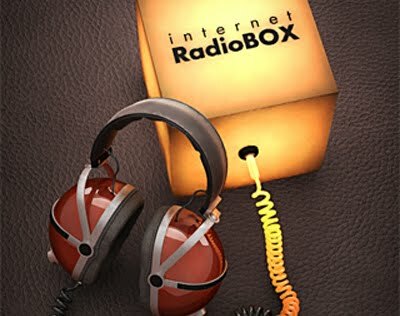 This 59p App simplifies the task of finding and listening to internet radio stations. 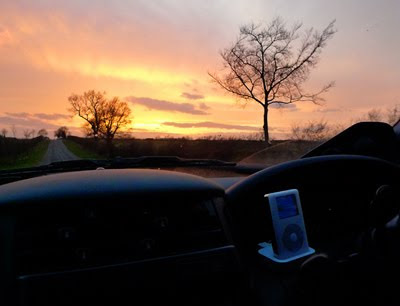 Most importantly, it means I can listen to BBC 6 Music just about anywhere. It provides a database of MP3 and WMA streaming stations, along with SHOUTcast and icecast directories. The program is highly configurable to allow for bandwidth use, and lets you browse the web while you're listening, using its own version of Safari. The UK team aiming to smash its own land speed record by driving a car beyond 1,000mph has settled on a final design for the vehicle. It calls for a major re-configuration of the vehicle's two power units, with a Eurofighter jet engine now being positioned above a hybrid rocket. The car, known as Bloodhound, will be built in Bristol's docklands. The team expects to start running the vehicle on the Hakskeen Pan, Northern Cape Province, South Africa, in 2011. Andy Green set the current World Land Speed Record in 1997 when he drove the Thrust SSC jet-powered vehicle at 763mph. The RAF pilot is now returning for a crack at his own mark in a project led by his old team principal, Richard Noble, himself a former land speed record holder. Many of the original Thrust design and engineering staff are also involved. 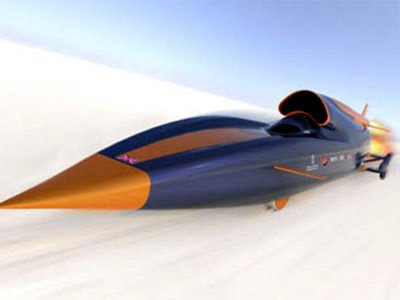 The Bloodhound group hopes the quest to take a car through 1,000mph will be an inspirational venture, in particular to young children thinking of pursuing careers in science and technology. Bloodhound now has more than 2,410 primary and secondary schools, 98 further education colleges and 33 universities signed up and using the Bloodhound education resources in their lessons. 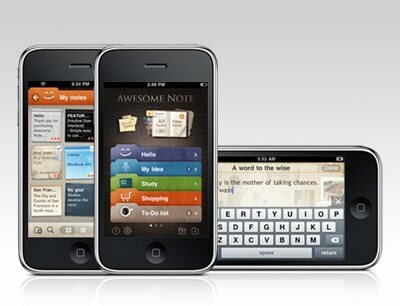 The iPhone comes with a simple note-taking App which works well and allows you to sync notes with a Mac's Mail application. Personally, I find it too simple, with the lack of ability to change the order of notes being particularly frustrating. There are a number of capable alternatives to the Notes App, but my favourite is the £2.39 Awesome Note. The interface is friendly without being too 'cutesy', and you can organise things in folders, or in 'all-notes-at-a-glance' panels. Notes can be displayed with different folder icons, colors, fonts and paper backgrounds. You can password protect notes, and import/export into Google Docs. For more information, and a link to the App Store, visit Bridworks. "...finally, the the Core i5 and Core i7 27-inch iMacs have arrived - and let me tell you, it was worth the wait." "With the new 2.66GHz Core i5 iMac and the 2.8GHz Core i7 iMac, Apple has not only blurred the line between consumer and professional systems, it's darn near erased it." 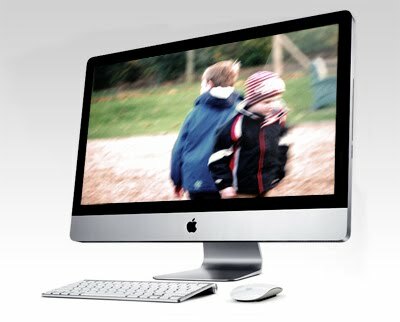 "The 2.66GHz Core i5 iMac offers faster performance at most tasks than the 2.66GHz Quad-Core Mac Pro. The Core i5 iMac also has more memory and more storage space than the 2.66GHz Quad-Core Mac Pro, while being $500 less (plus you get a 27-inch screen with the iMac)." "Unless you absolutely require additional PCI cards, multiple internal hard drives, or a lot of RAM, the Core i5 iMac makes a strong case for the being the go-to system for most Mac professionals." The SQRL (pr. 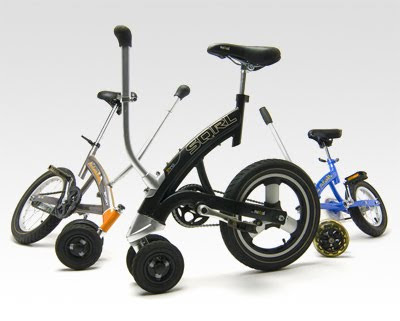 'squirrel) is a stylish action vehicle that enables you to move around by pedalling like a regular bicycle. 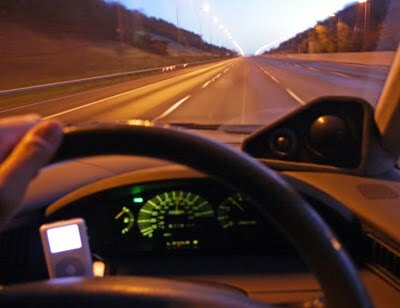 However the steering is done by moving your upper body towards the desired direction. The Cannondale Dutchess is a result of the final year graduation project of Wytze van Mansum, from the Delft University of Technology. 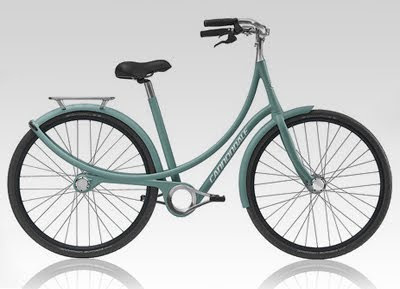 "Designed for women keen to express their style amongst the fast paced and ever changing urban vibe, the Dutchess brings modern lines to the environmentally conscious whilst at the same time offering longevity and low maintenance," said a company statement. The rear mudguard acts as a structural part of the frame, supporting the carrier with a load of up to 50kg. The arch connects the bicycle from the handlebars to the tail-light. 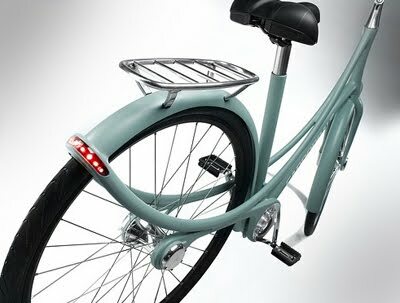 The hub brakes are self-adjusting to compensate brake pad wear and since the brake lines are integrated into the frame, they can act as wheel locks by folding the levers into the handlebars. 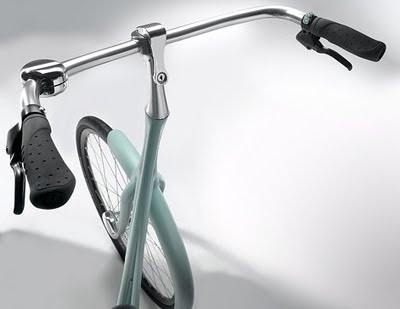 Adjustable handlebars allow for different riding positions and can be folded together for easy storage or used for locking the bicycle securely to a fixed object. The total weight would be kept under 14kg through the integration of parts and functions. 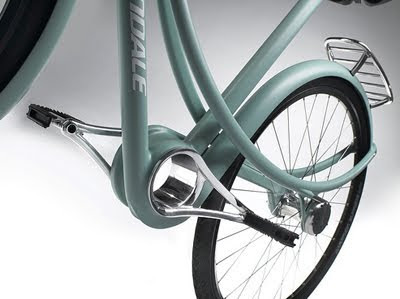 Gearing and transmission are fully enclosed, allowing the bicycle to be ridden in normal clothing. Although fully rideable, the project is currently only a prototype. 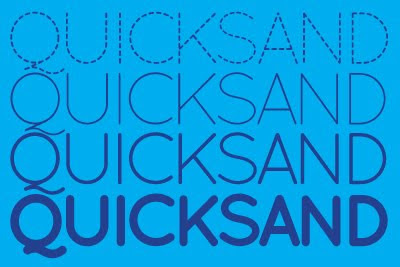 Font Squirrel is hosting this Web 2.0-friendly 'soft-sans' in 3 weights (and faux italics) plus a quirky 'dashed' version. 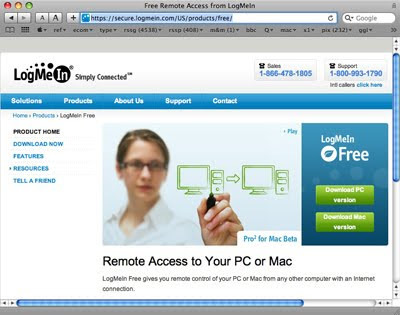 Install LogMeIn on the computer you want to access, log into your account from another computer and click the computer you want to control. You'll see its desktop and be able to use all the applications on your remote computer as if you were sitting in front of it. Brett's 2p'orth: I've been using it for a while, and it works as advertised. I've also bought the iPhone App, which works just fine. If you want file transfer, remote sound, printing etc, LogMeIn Pro² is available for a free 30 day trial. A California company has combined a Corvette with a luxury speedboat and thrown in some jet ski to create the WaterCar Python. For around $170,000, you can pick up a Python rolling chassis and install a General Motors LS series engine of your choosing — from a used LS1 to the same mind-bendingly powerful LS9 found in the Corvette ZR1. Choose that level of insanity and WaterCar estimates the engine and transaxle installation should run an additional $30 to $50K. Once installed, the Python will make short work of your trip to the boat launch with an average 0-60 time of 4.5 seconds. Once you get to the yacht club, stun your high society friends by driving the Python straight into the water, pressing one button to retract the wheels and another to start the jet. 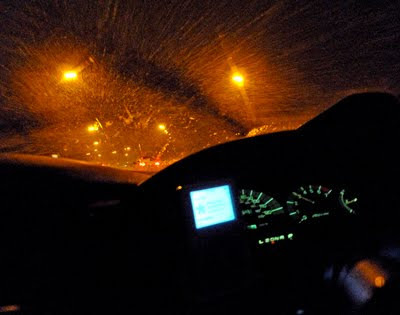 You’ll be gliding on a bright blue highway in seconds. 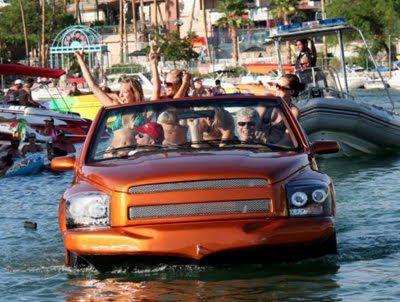 Far from a glorified Amphicar, this baby can do 60 mph on the water. Cupertino's multi-pronged strategy to put an iPhone into the pocket of every smartphoner, mobile gamer, and on-the-go web surfer is working. According to the market researchers at Strategy Analytics, the iPhone vaulted Apple past Nokia to become the number one handset vendor in the world when measured by profits. 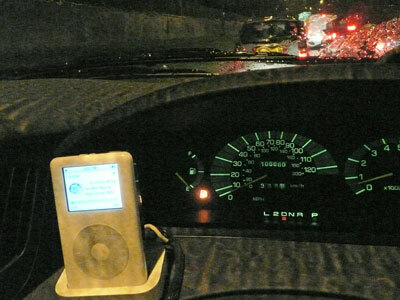 In the third quarter of 2009 Apple's phone-based profits totaled $1.6bn, while Nokia pulled in $1.1bn. And Apple isn't content with dominating handset-profitability metrics. It also has its eye on pocket gaming. Nintendo president Satoru Iwata recently told a company gathering that "If we can't make clear why customers pay a lot of money to play games on Nintendo hardware and Nintendo software and differentiate ourselves from games on the mobile phone or iPhone, then our future is dark". The GXR system uses interchangeable lens/sensor units - every lens comes in a sealed unit complete with sensor, shutter, aperture, processing engine (there's also one in the camera body) and the motors necessary to focus the lens (and drive the zoom mechanism if present). 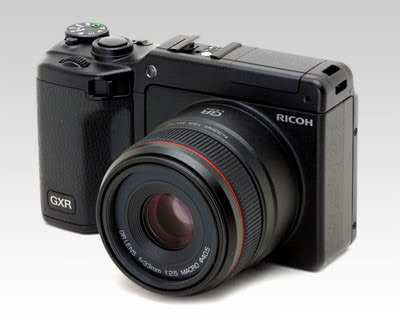 You are, essentially, buying a new camera every time you buy the lens: the GXR body is little more than a shell containing the screen, card slot, controls and flash. The GXR launches with two very different optional lens modules. Although the body is very thin, how pocketable the camera is depends entirely on the lens module mounted: the S10 zoom unit maintains the low profile when not in use (it collapses when powered down) but the A12 prime is a fairly large unit. Brett's 2p'orth: I have no idea whether this is a triumph or a turkey. What I do know is that the pre-production sample images are impressive, and that I am looking forward to visiting my local Jessops for a 'hands-on' when it is released in the UK. A new technology was announced at Intel Developer Forum which provides initial data rates of 10 Gigabits and potential scalability to 100 Gigabits and beyond; something copper won’t be able to achieve. 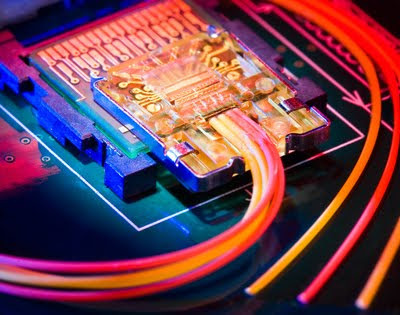 Light Peak also supports multiple simultaneous protocols which will allow bandwidth aggregation of the various interconnects used in systems today onto a single high speed, thin, flexible, and long cable and small connector. Imagine being able to connect to your camera, display, docking station, or external hard drive through a single, thin connector. Light Peak is in the developmental stages, but Intel Executive Vice President General Manager, Intel Architecture Group Dadi Perlmutter showed a demonstration of real silicon transmitting storage, LAN data and display (1080p) data across a 30m fiber optic cable. The end goal is to make Light Peak a complement to existing I/O technologies by enabling them to run together on a single cable and at higher, and more scalable speeds. In what looks more like an Onion prank than an actual piece of hifi, the Swedish audio company Brothers has released the Wall of Sound (WOS) iPod speaker. 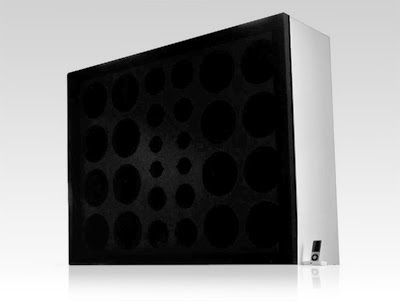 Powered by a 125 Watt tube amplifier, this 28 speaker monster measures 94x125x31cm, and weighs over 100kg. You can order yours from the Brothers website for a mere $4,495. Draganfly Innovations Inc. started as a small mail-order business specializing in radio controlled flying machines. We soon began selling our unique, four-rotor helicopter, the Draganflyer. The Draganflyer was originally designed to be an easy-to-fly, low-maintenance helicopter which evolved into a camera platform. Draganflyers are extremely sophisticated, high performance, yet easy-to-fly, affordable machines. 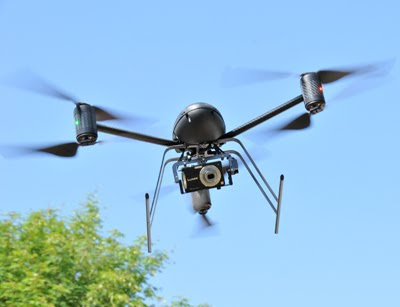 The collaboration of ideas from our customers, employees, and associates has resulted in the release of our most exciting and capable aerial photographic platform yet: the Draganflyer X6 Helicopter, the ultimate in ease of flying and usability. 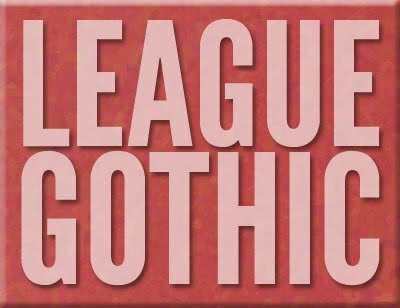 Full trailer available here. I may yet forgive Mr Cameron for Titanic. 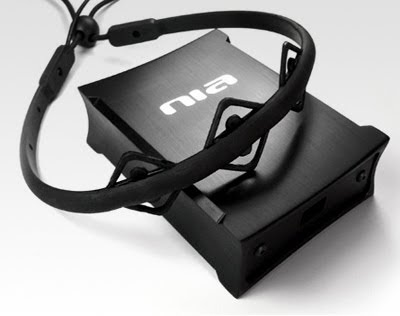 OCZ’s Neural Impulse Actuator (nia) marks a new era in gaming. Rather than being a substitute for a mouse, the nia is a pioneering new peripheral to be used in conjunction with your mouse for a more immersive gaming experience. The nia is compatible with any PC game using keyboard input. 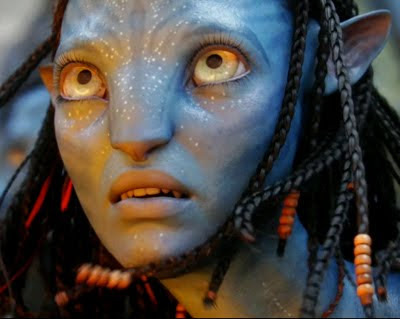 Predefined profiles included with the software allow the gamer to develop their own nia—memory to launch the desired behaviour of their character without lifting a finger. The headband uses carbon nanofiber-based sensors to provide the highest possible dynamic range for the recording of bioelectrical signals that are amplified and digitized and further de-convoluted into computer commands. It looked as if a large chunk of Hampshire, complete with trees, apartments, and a street lined with shops and bars, had broken off and floated out into the middle of the Solent. 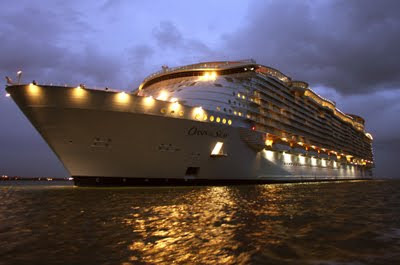 But this was no monster piece of flotsam and jetsam but one of the biggest man-made objects to move across the face of the planet, the vast new cruise ship, Oasis of the Seas. 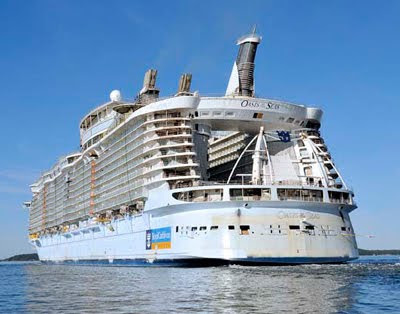 At 220,000 tons, and able to accommodate 6,300 passengers and 2,000 crew, Oasis of the Seas breaks all records. She is divided up into seven separate 'neighbourhoods' including one called Central Park which is open to the sky and features trees, grass lawns and flower-beds. Other passenger attractions include an ice rink, a cocktail bar that rises up and down the decks, a water theme park, a full-size fairground carousel, and a shopping area with bars, restaurants and cafes. Nintendo president Satoru Iwata has announced that sales of the Wii console have fallen significantly over the past six months. Sales of the system suffered a 40% drop over the time period, with 5.75 million units sold worldwide in September 2009, compared to 10 million the previous year. Iwata attributed this to a lack of significant software releases. 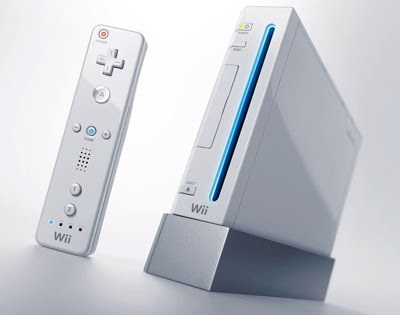 "Wii has stalled," he told a press conference. 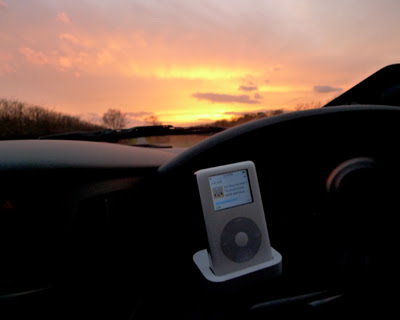 "We were unable to continually release strong software, and [we have] let the nice mood cool. We were unable to show a new game to become 'the next thing'. In the game market, once you've lost the momentum, it takes time to recover." 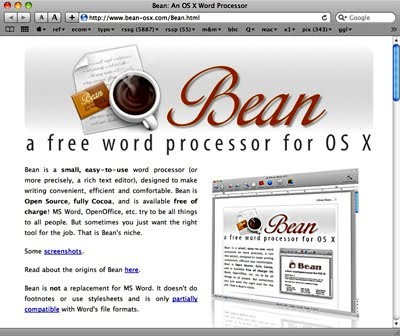 Our quest for the ultimate writing tool continues with Bean a stripped down and superfast word processor. It lacks a full word processor’s more advanced features, but Bean handles all the same files as TextEdit in an interface that’s easy to understand and looks great. It’ll even export PDFs. Bean’s selection tools are a revelation, with options for choosing by font style, ruler and even colour, making it easy to handle large documents. With features such as live word count, autosave and page layout mode you won’t feel deprived. We’ve found ourselves using Google Docs a lot lately. Bean gives you the same simplicity, power and lack of clutter at the same price: nothing. 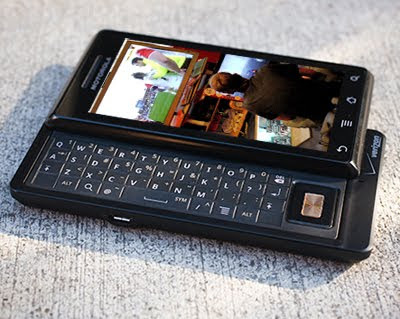 The Droid is Motorola's second attempt at an Android phone but the first one they've actually gotten right. More importantly, it's one of the first phones that can legitimately stand head-to-head with the iPhone - and come out ahead in some significant respects. Physically the Droid is not much to look at because of its boxy, angular frame. Its hefty 170g weight doesn't make it especially pocket-friendly either. 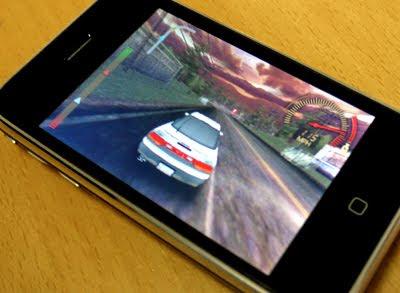 The touchscreen display is a shade bigger than the iPhone 3GS, but it has much higher resolution, with 854 x 440 pixels compared to the iPhone's 480 x 320. The virtual keyboard is fantastically responsive with very little input error. The slide-out physical keyboard is one of the few disappointments of the Droid. The small, flat buttons make it difficult to crank out text. The Droid runs Android 2.0 as its OS. It feels more refined than the first version of Android on T-Mobile's G1 and it's certainly better than the muddled interface on Motorola's Cliq. 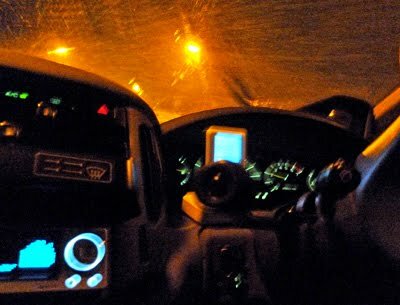 The Droid's 5-megapixel camera produces photos that aren't too noisy and it does well even in low light, thanks to the built-in LED flash. The browser is excellent and displays web pages quickly (though Flash websites are still out of bounds). You can toggle through multiple windows and scan them in an easy list view. You double-tap the screen to zoom in and out - which works, but we miss the 'pinch to zoom' gesture found on the Palm Pre and iPhone. There's no native multi-touch support in the Droid. If it were 2 ounces lighter and had a better keyboard (or no keyboard at all), it would be hands-down the best smartphone on the market today. As it is, it's a solid contender in a market that has too long been dominated by just one top-quality handset. Heartbreaker (Live) - Pat Benatar, Sheryl Crow, Dixie Chicks, Emmylou Harris etc.